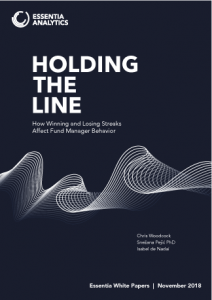 Holding the Line is the first piece of research that we know of to examine the impact of winning and losing streaks on portfolio manager decision-making behaviour. Short term winning and losing streaks are, of course, something that all fund managers experience. And yet even the longest term investors, if they’ve studied behavioural finance, would accept that the feelings associated with being ‘on a roll’ (or in a rut) may have an impact on the way they make investment decisions. But very few managers can tell you exactly how a performance streak impacts their behaviour, and how much value that behavioural change creates or destroys. Essentia Insight clients can – and can then set a Nudge to remind them, the next time a streak occurs, making it possible to deliberately mitigate bias. 50% of the active equity portfolio managers in our sample showed some (significant) change in behaviour after experiencing a 5-day winning or losing streak; 35% of the managers analyzed made significantly worse decisions when on both winning and losing streaks, costing them an estimated 35bps of performance (or relative performance, where relevant) per annum, on average.